A critical anthology that re-examines Jacques Derrida’s thought by way of theory and praxis, this volume reflects on his striking legacy and the future of theory. Among contemporary thinkers, Derrida challenges not only our ways of thinking but also hitherto methods of inquiry. This book captures how Derrida renovates and re-energises philosophy by questioning the fundamental assumptions of Western philosophical thought. By doing so, he exposes the intricate lie behind binaries, such as speech/writing, nature/culture, male/female, black/white, literature/criticism, etc., which have continued to shape our worldview, where a hegemonic centre is always already in place dominating or marginalising the ‘other’. 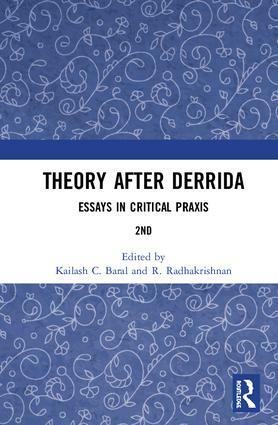 A significant contribution to literary theory, this book explores not only the status of Derrida’s contribution as a critical thinker but also the status of critical theory as such in the contemporary milieu. The central question that it asks is whether we should dismiss Derrida as a thinker who espoused an extreme form of relativism, bordering on nihilism, or has he something fundamental to contribute to the future of theory. Could it be that deconstruction is not destruction but a possibility that casts doubts on whether the present can have faith in future? This second edition includes a new Postscript and addresses some important concerns of our times, such as religious practice, art and aesthetics, translation, sociology of philosophy, and democracy. Scholars and researchers of English literature, philosophy, sociology and cultural studies will find this work particularly interesting. Kailash C. Baral is currentlyProfessor of India Studies in the Department of Comparative Literature and India Studies at the English and Foreign Languages University, Hyderabad, India. Prior to this, he was Professor of English and Director at the English and Foreign Languages University, Shillong, Meghalaya. He has authored Sigmund Freud: A Study of His Theory of Art and Literature (1994), and edited J. M. Coetzee: Critical Perspectives (2008); Humanities and Pedagogy: What is Needed Now? (2002); and Interpretations of Texts: Text, Meaning and Interpretation (2002). Some of his co-edited volumes include U. R. Anantha Murthy’s Samskar: A Critical Reader (2005); Reflections on Literature, Criticism and Theory (2004); Theory and Praxis: Curriculum, Culture and English Studies (2003); and Identities: Local and Global (2003). His edited anthology Earth Songs: Stories from Northeast India (2006) has been translated into Kannada, Hindi and Bengali and is a prescribed text at Sikkim and other universities. His articles have appeared in international journals such as Pedagogy, South Asian Review and International Journal of Baudrillard Studies among others. R. Radhakrishnan is Chancellor’s Professor of English and Comparative Literature at the University of California, Irvine, USA. He is also affiliated with its Department of Gender and Sexuality Studies, and is a core member of the Department of African American Studies and the PhD programme in Culture and Theory. Along with more than a hundred essays in academic journals and edited collections, he is the author of Diasporic Mediations (1996), Theory in an Uneven World (2003), Between Home and Location: The Cultural Politics of Theory (2007), History, The Human and the World Between (2008), and Edward Said: A Dictionary (2012). He is the editor of Theory as Variation (2007) and coeditor (with Susan Koshy) of Transnational South Asians: The Making of a Neo-Diaspora (2008). Winner of numerous awards including the Fulbright, he is a published poet both in English and Tamil with a book of poems in Tamil and is a translator of contemporary Tamil fiction into English. He is currently working on a series of essays on humanism and post-humanism.